I was looking for a bit of clarification on #NoEstimates, and I remembered reading one of Neil Killick’s posts about it that I thought would be relevant. As I was combing through his blog, looking for the post I had in mind, I stumbled across People Need Estimates. What caught my attention was not so much the title of the post, but the image of a red umbrella that went along with the post. That image of the umbrella, along with the title, had me making the connection between #NoEstimates and the work of Peter L. Berger because Berger says that society creates a sacred canopy (or umbrella) to help us relate to the world in a consistent way, and if we are forced to move from under that canopy we face chaos and fear. I began to get excited as I read the article because, whether he knew it or not, and reference to the umbrella aside, many of the points that Neil was making were resonating with what I remembered reading in Berger’s book The Sacred Canopy: Elements of a Sociology of Religion. The thing that struck me the most was that #NoEstimates was not in the nomos of our software development methodologies, and thus contains a great deal of anomic potential, making widespread adoption an uphill battle. Let me give a little background information before I talk more about nomos and anomic potential. It starts with what Berger termed Externalization, Objectivation, and Internalization. Berger starts by saying that people feel out of kilter or off balance because the way we relate to our environment changes the environment (he calls this externalization), and so our relationship with the world is always changing. He also says that what people really want is to feel in balance, and to be able to predict how they will need to relate to the world. Society then, says Berger, gives us that feeling of being in balance with the world by making things familiar and providing us with an environment in which we can predict how we will need to relate to the world. To help us feel like we are in balance society, according to Berger, teaches us to make the same choices in how we relate to the world. Repeatedly. This has the effect of making us think that the world is more objective and less likely to change, and so how we relate to the world will not change (he calls this objectivation). Moreover, it makes us forget that the choices we make as we relate to the world are really choices at all, and we begin to think of them as the way things are supposed to be. Berger says that society does its job so thoroughly that as we become more socialized we begin to internalize the objective world that it creates (which he calls internalization). So, not only do we come to think that the way things are done is the only way that they could be done, but we start to associate our own identity with the way these things are done. This, in turn, leads us to feel out of balance with the world if we do things any other way than society tells us they should be done. Society has created an entire, illusory world view, and this is what Berger calls the nomos. Nomos is everything that society has taught us, including everything that we think about the way the world really is and how we relate to that world. It’s everything that keeps us feeling like we are in balance and, just like creating an objective world that we can relate to, society’s job is to make us think that the nomos it provides is objective and unchangeable. So, when Neil says that people need an umbrella, that’s true from the point of view of the nomos that was created by society. When he says that people don’t need umbrellas, they need a way to stay dry on a rainy day, that’s from a point of view outside of that nomos. But this can threaten the legitimacy of the established nomos. It threatens the stability of the nomos, possibly to the point that the nomos is destroyed. This is what Berger calls anomy, and things that are outside of the nomos and have the potential to disrupt it have “anomic potential.” Since the nomos provides a sense of stability, comfort, and balance to the world, anything outside of that is seen as chaotic and terrifying; it’s the fear of the unknown, and people use the nomos as a sort of shield against it. So how does that tie in with #NoEstimates? As I said above, it’s fear of the unknown. Estimates are a part of the nomos created by the “society” of software development. So, even though estimates can be useful at times, the current nomos says that we are to use estimates to get a price and a date for developing software. To obtain a price or date without using an estimate is outside of the nomos. #NoEstimates is scary; it’s anomy, and represents a certain amount of anomic potential. And that’s why #NoEstimates faces an uphill battle; it’s a social change, and social change is hard because you really have to change the nomos before you can realize the change in society. It’s not that people don’t think it’s a good idea or that they can’t do it; everyone, whether they are aware of it or not, has the ability to act independently of the nomos. Instead, it’s more a fear that doing so will highlight the sense of being out of balance with the world, and we don’t like that. I suspect that’s also a big factor as to why Woody Zuill says in his blog post on Life, Liberty, and the Pursuit of Agility that few people are willing to give an outright answer when he asks them "if you found estimates bring no value – what would you do?" It’s like looking death in the face. It’s unsettling because it represents so much anomic potential, and so we prefer not to do it. If you’re a tester and you’ve been around social media, attended a conference, watched a webinar, read blog posts, or watched videos of other testers speaking on YouTube, you may have heard at least one mention of polimorphic and/or mimeomorphic actions. But what does it mean when someone says that an action is polimorphic or mimeomorphic? Where do these ideas come from, and why, as testers, do we care? 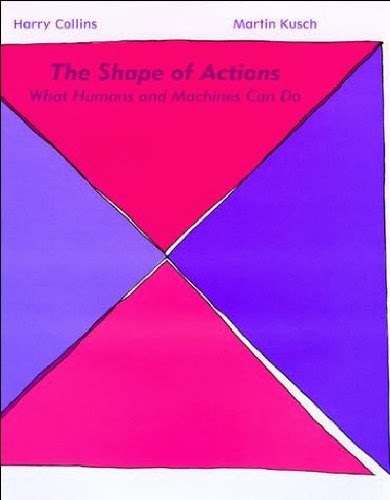 The concepts of polimorphic and mimeomorphic actions come from the book The Shape of Actions: What Humans and Machines Can Do, by Harry Collins and Martin Kusch. In the book the authors develop a new theory about what they call the shape of actions. I’ve attempted to cover the highlights and general topics of discussion, or at least what I found most interesting, from each chapter in the summary below. In Chapter 1, Collins and Kusch introduce the reader to their theory which basically states that humans can do three things – they can do polimorphic actions (actions that draw on an understanding derived from a sociological structure), they can do mimeomorphic actions (actions that are performed like machines, and do not require an understanding derived from sociological structure), and they can merely behave. The authors are concerned with how actions look from the point of view of an observer; they say they are concerned with the “shape” of actions, or what they call action morphicity. The authors conclude their introduction to the shape of actions by discussing the two key entities of this theory – the humans, which are all entities that can perform polimorphic actions, and the machines, which are all entities that cannot do polimorphic actions, and how the boundaries between these two entities is permeable (after all, humans do act like machines in many instances), and how the theory of actions may establish new boundaries between humans and machines. This chapter begins the discussion of what a theory of action is by suggesting that actions may be classified as one of two types, depending on the behavior that instantiates them. The authors also make the distinction between actions (the things that we can do in a society, that get their sense from taking place in that society) and behaviors (physical movements, including those that we use to execute the actions we intend), with the primary differentiator being that actions are intentional. In particular, the theory of actions is concerned with what are called formative actions, those actions which not only get their sense from taking place in a society, but that also make that society what it is and distinguish it from other societies. The authors then go on to describe how actions and institutions are what they term “social kinds” because they exist only as long as those who are in the society/institution act as though they exist (for example, money), and “natural kinds,” which continue to exist regardless of how those taking part in the society choose to act. Chapter 3 also introduces what the authors call an action tree. Action trees are diagrams that represent the relationships between actions, and look much like decision trees with the exception that the authors adopt some conventions to indicate the morphicity of the action represented at a certain node. In an action tree, the nodes at the higher levels represent actions that are realized further down the tree by other actions that are more specifically defined. The authors begin discussing interactions, both within a culture (humans to humans) and across cultures (humans to machines) in Chapter 4. The primary means of intra-cultural interactions is via action cascades, in which one actor, A, carries out an action for another actor, B, in such a way that A’s action is a sub-action of B’s action. The polimorphic/mimeomorphic dichotomy is applied to action cascades at the point where the transfer of action takes place, resulting in the identification of two types of cascades – Control Cascades, in which the action above the transfer is polimorphic and below the point of transfer is mimeomorphic, and Indifference Cascades, in which the action above the transfer is mimeomorphic and below the point of transfer is polimorphic. Since polimorphic actions derive understanding from within our sociological structure, and that structure is non-existent across cultures, the authors conclude that different cultures may only incorporate the mimeomorphic actions of other cultures into their own action cascades. Chapter 5 begins the discussion on what is involved in human learning, and how the theory of actions applies to human competence and the transfer of sets of actions. The authors guide the reader through several examples of actions, starting with special singular mimeomorphic actions which are learned through “calculation” that requires no need for practice or drill, through increasingly complex actions, ending with polimorphic actions that can only be learned through social skills. The authors provide two main insights through these examples. First, they show how action morphicity helps us understand how competencies are learned. Second, they demonstrate that the mimeomorphic/polimorphic dichotomy does not correspond to other ways of dividing up our abilities. For example, mimeomorphic actions may be either skilled or unskilled and they may be self-conscious or internalized. The chapter concludes with a discussion about the ability to transfer sets of actions or competencies between cultures, establishing the “irreplaceability thesis” which draws on the self-referential nature of polimorphic actions to state that they may only be learned by social interaction within the society to which they belong, whereas mimeomorphic actions can be decontextualized, and hence may be transferred between cultures. The authors make an interesting observation that proves to be fundamental in determining what machines can do: the differences between the three types of machines are largely a matter of perspective based on where we are in the action tree. This leads to the general rule that we can view tools as proxies by using a vantage point lower in the action tree, and we can view proxies as tools by taking a higher vantage point in the action tree. The argument then follows that what we have been seeing as proxies should really be seen as tools because we have been inattentively “repairing” the deficiencies of the machines and attributing the machine with doing an action for us when it was really only helping us to do the action better. The authors then bring the power of a fully operational theory of actions into play by saying that machines can only act as proxies when the actions they perform are far enough down the tree as to be mimeomorphic, and that the proper attribution of agency can only be applied up to the point in the action tree where polimorphic actions begins. Chapter 8 applies the dichotomy to organizations, and seems to extend the findings from the previous chapter by saying that even with respect to organizations, we have had the wrong vantage point, and so even the things we thought were mimeomorphic are instead polimorphic. The rules within bureaucracies, for example, do not come with rules for their application, and thus still require contextual interpretation by the actor. The book also gives the example of “complete deskilling” at a restaurant such as McDonald’s where replacing esoteric with ubiquitous skills makes it seem like a mechanical process, but it is not deskilling because it is a transference of the responsibility of exercising the skills to another actor (the customer in the case of McDonald’s). The authors discuss how the dichotomy may be applied to the world of science, showing that what is typically presented as a field dominated by mimeomorphic actions is, in fact, heavily reliant on polimorphic actions, and has been made to appear so due to the repair that historians have made as they recorded the events. In Chapter 9 vacuum pumps are used to examine the skills required to operate a device, and how those skills change as the device changes. Comparing the use of modern, automated vacuum pumps and Robert Boyle’s experiences with vacuum pumps in the seventeenth century, the authors found that skills don’t change much when we have active closure because those skills are still needed to operate the device, but they do change as we move towards passive closure. In the case of active closure, which says that an instrument whose use has been accepted and whose general principles of design have been settled still requires skill and agreement to make it work, we have theoretical indifference at this point (say that we are indifferent to what mixture is used to seal the leather used in Boyle’s pump) but not behavioral indifference. Skills do change once we begin moving towards passive closure, however, because we have moved into the realm of behavioral indifference, and at a certain level it becomes a matter of indifference to all parties, at which point we are talking about mimeomorphic actions. The authors begin the discussion in the final chapter of the book by pointing out that the distinction between polimorphic and mimeomorphic actions does not match other dichotomies, such as the action versus behavior dichotomy, the action versus basic action, and several others. The point the authors make between their theory and other theories of action is their theory states that, in principle, all mimeomorphic actions may be mechanized, though some of them may be too complicated to do so, because the way the engineering is done is not crucial in the theory they provide. Instead, they claim that the idea of mimeomorphic actions creates a common ground for actions and behaviors that other theories do not. The Shape of Actions is a tough yet rewarding read. It’s rather academic, and is one of those books written for another field (the authors refer to it as sociphilosophy), but it remains very applicable to software testing, and is a book that I'll be returning to frequently. My thoughts kept turning towards test automation as I read the book, which really makes sense given that the theory creates a common ground where actions and behaviors can cohabitate and discusses, in great detail, what machines and humans can do. In particular, I found the discussions on special and casual disjunctive mimeomorphic actions very beneficial with respect to model-based test automation. But there are many more ways that the information from the book may be applied to testing software, whether it’s during test planning, test design, test execution, or test reporting. I plan to post several follow-up posts based on ideas from the book and how I apply those to my testing activities. My challenge to you is to read the book, apply what you learn from it to improve or expand your own testing activities, then come back here and post a comment to let me know how you have put that information to use.